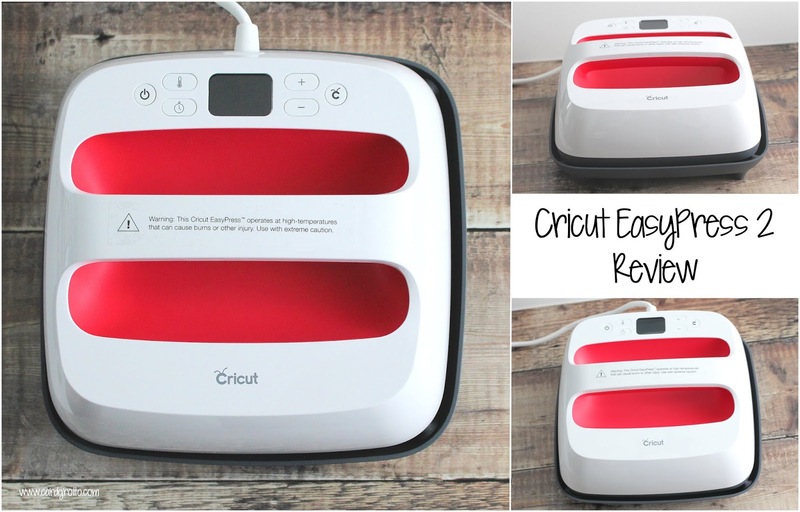 Hello there, following on from my review of the Cricut Maker, today I have a review of the Cricut EasyPress2 to share with you. This was kindly sent to me to review from Cricut but as always, all opinions are my own. 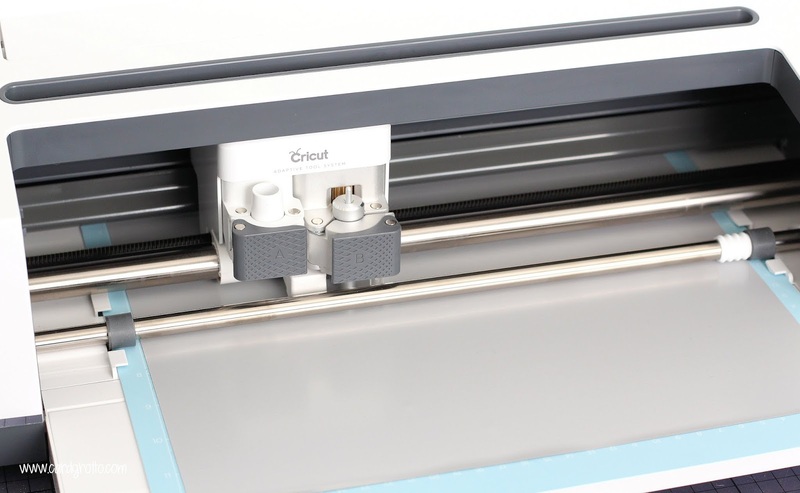 The Cricut EasyPress 2 is used to adhere a material to another material using heat. Most people use it to adhere heat transfer/iron-on vinyl to fabric to decorate t-shirts, cushion covers, bags etc. but it can be used for a lot more. 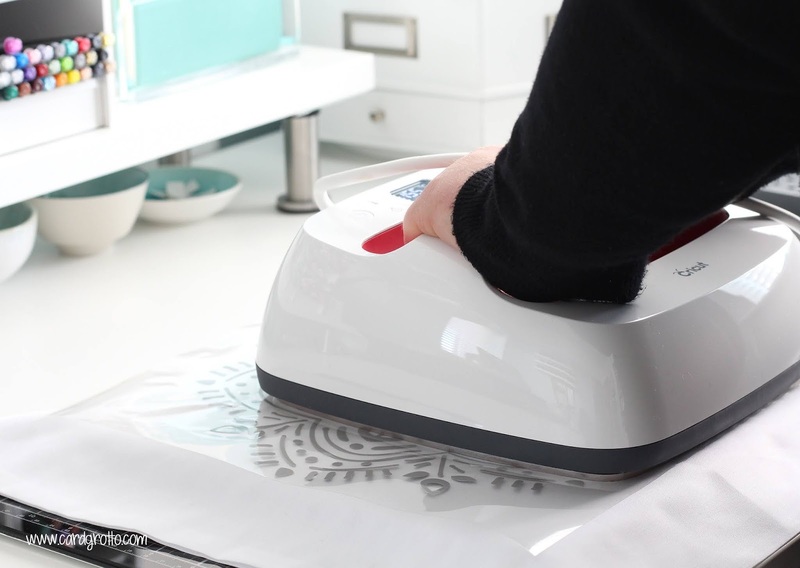 If you did not have a gadget like the EasyPress 2, you would either use a heat press, which is bulky, expensive and not portable; or an iron, which is difficult to control the temperature with. In the box you get the Cricut EasyPress 2, the safety base, a welcome book, materials for practice project, safety instructions and warranty. You can adhere a number of different materials with the EasyPress 2. You can adhere iron-on/heat transfer vinyl, foil and fusible fabric easily. 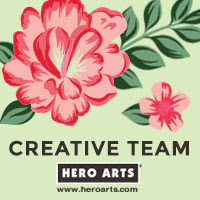 You can adhere these on to a number of surfaces including fabric, canvas, cardstock (including notebooks), leather, wood, corkboard and chipboard. 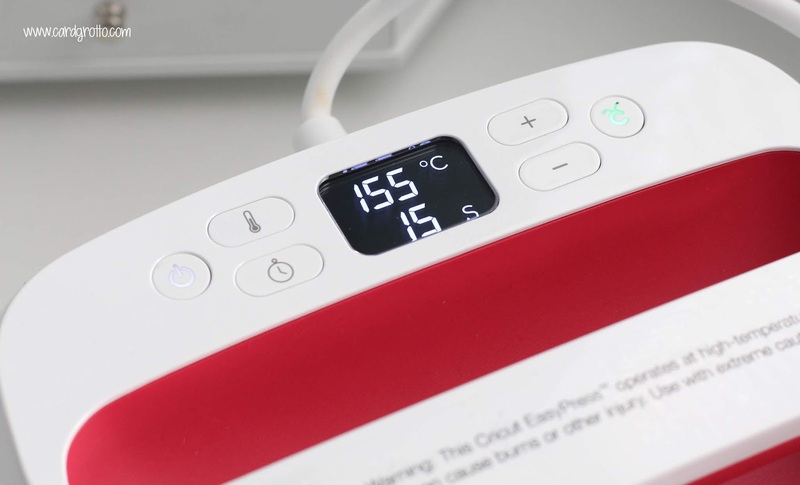 The EasyPress Interactive Guide on the Cricut website tells you what temperature to set the EasyPress at, as well as how long you need to press the material for. It also gives you step-by-step instructions of what to do. So now I have explained what the EasyPress 2 can do, I would like to show you what I made! I did make the practice project first but then kicked off by creating a cushion cover. I went to the Cricut Design Space to find a design that I liked. 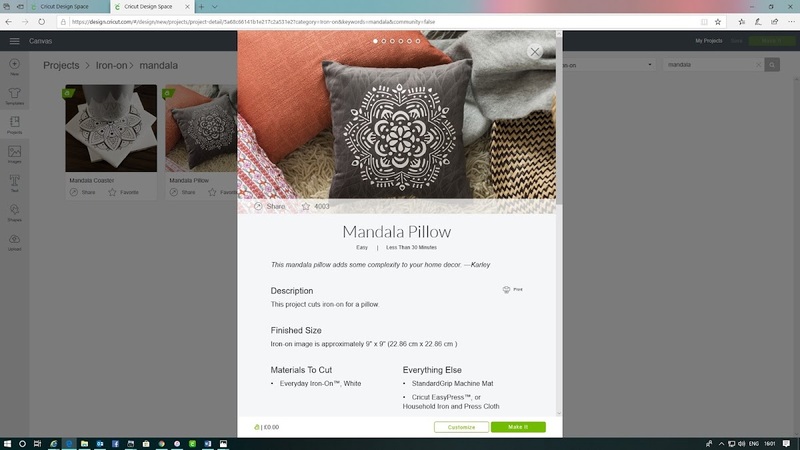 I saw the Mandala Cushion Cover project in the iron-on section and thought it was a lovely pattern. 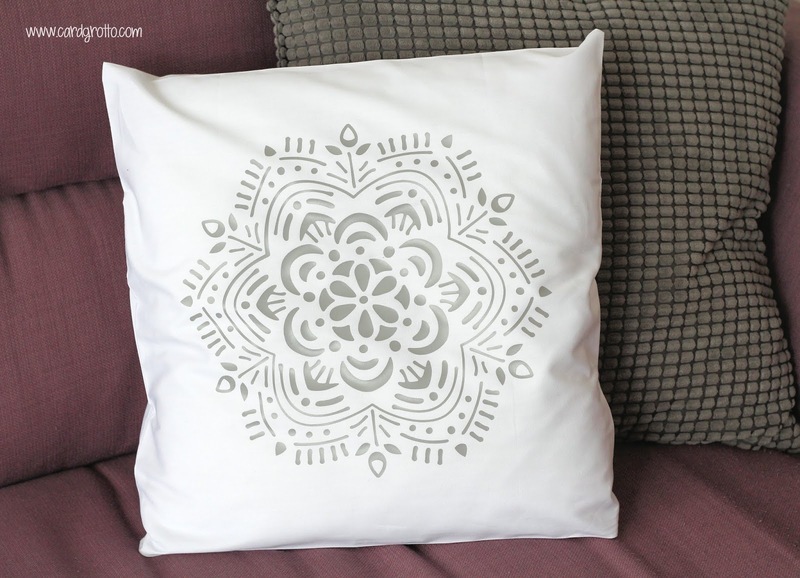 I customised the size to fit my cushion cover and then proceeded to cut it on the Maker using Grey Iron-On Vinyl. 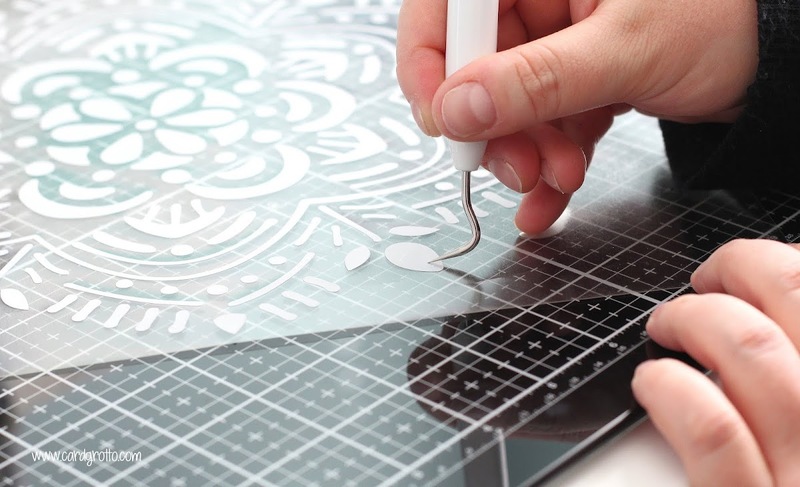 The Cricut Design Space explains that you need to mirror your design and place the vinyl shiny side down when cutting. 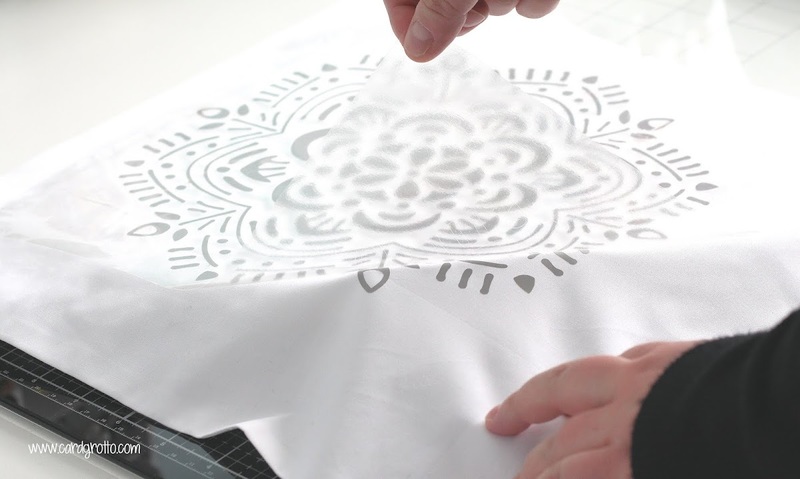 Once it was cut, I took the vinyl off the mat and peeled back the back layer of the vinyl to reveal the pattern. You then need to remove any inside bits from the vinyl that you do not want. This is called weeding and I find it helpful to use the Cricut Weeding Tool for this. 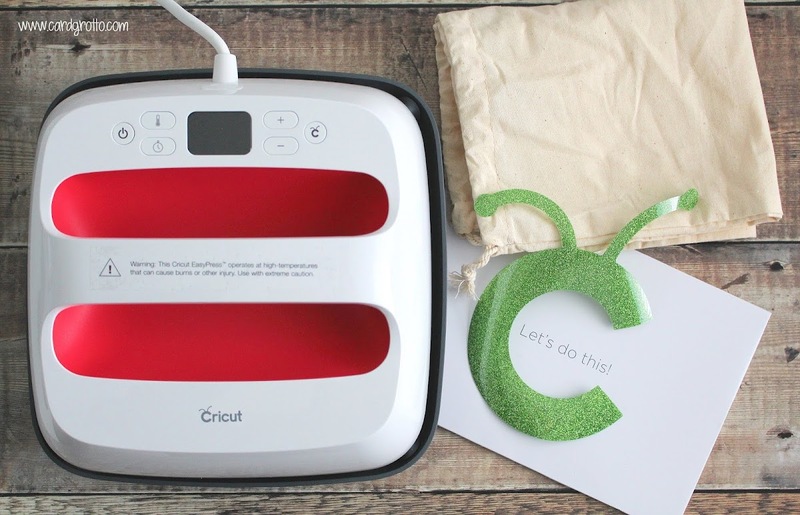 Once my vinyl was ready to go, I visited the EasyPress Interactive Guide on the Cricut website. This shows what I need to set the temperature at and gives instuctions on using the EasyPress. I told the guide that I was using Everyday Iron-on Vinyl, that I was adhering it to 100% cotton and I was using the Cricut EasyPress Mat. This is used to protect your work surface but you can use a towel instead. 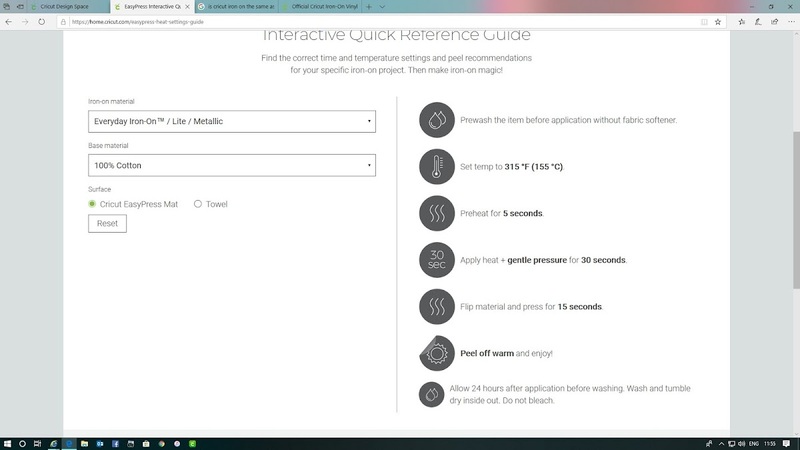 It told me the settings for the temperature and told me to pre-heat the material for 5 seconds. I then applied my vinyl on top of my cushion cover and placed the EasyPress 2 on top. I started the timer and applied gentle pressure for 30 seconds. I did have to do this a few times to cover the whole image, as it is quite large. I then flipped the material and applied heat from the back too. I started to peel the vinyl sheet off and it did not feel like it was coming off easily, so I applied more heat and tried again. The second time it removed perfectly and left a lovely design on the cushion cover. I placed the cushion inside the cover and now I have a lovely cushion for my sofa! For my next project, I thought I would add a design on to the front of a vest top. 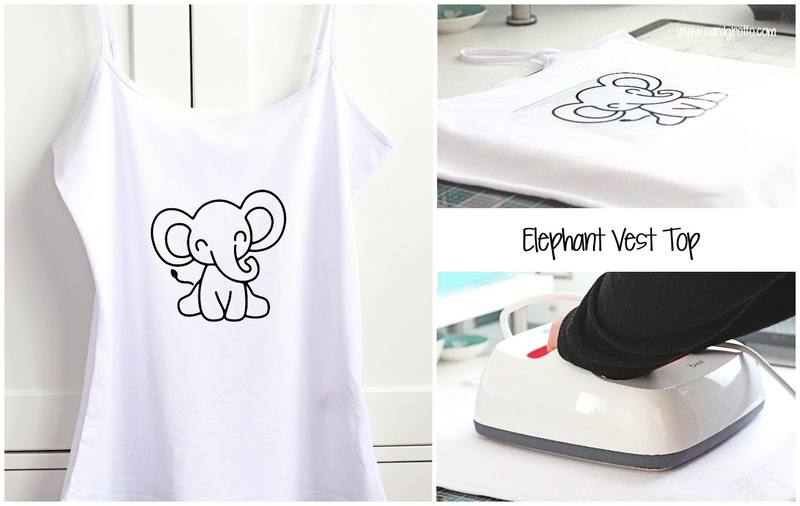 I scrolled through the images on Design Space and came across an adorable elephant image that I thought would look really cute on the front of the vest. I followed the same steps as above and used Everyday Iron-on in Black. I love how it came out! For my last project, I decorated a pencil case that I will use to keep my Cricut pens in. I made a design in Design Space using the Cricut DonJuan font. I cut it with the Maker and then used the same steps as above to add the design to the front of the pencil case. I used Glitter Iron-on for this in white. Sadly the glitter does not show up in the photos but in real-life, it is really pretty! I want to put this out there, I am a complete heat transfer vinyl newbie. I have never used any other heat press or even an iron for anything like this. Having said that, the Cricut EasyPress 2 is very easy to use, I love that the EasyPress Interactive Guide tells you exactly what to do to use it. Although I have never used an iron for applying heat transfer vinyl, I am assuming that it is difficult to know how long to apply the heat for and the temperature is not regulated. The EasyPress 2 takes the guess work out of that for you. In terms of size, I think the 9" x 9" one is a great size and perfect for lots of different applications, but as a newbie, I may have gone for the smaller one. If you were frequently making projects where you needed to apply heat, I think the EasyPress 2 is a great investment and would definitely improve your workflow. I am looking forward to creating more items for both myself and gifts for my family. I hope that you have found this review helpful in seeing what the EasyPress 2 can do but do bear in mind, there are lots of other things that it can do. Thank you so much for stopping by today, I really do appreciate it. Have a great day! 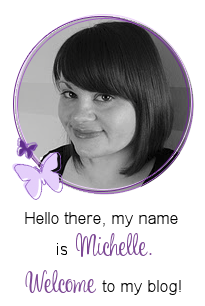 Oh how fabulous Michelle! Looks awesome! I am so glad you loved it. It really looks like a good investment for me and my business. 9 x 9 is the perfect size for most of my projects. Absolutely adore the pillow!!! So glad you have enjoyed using it. I definitely think it will be much easier than a using an iron - I use mine for my fusible fleece and it is tricky to know how hot to get it and how long to leave it on. Brilliant review! Wow! I love the pillow! Very cool machine! !